When you’re ready to get away from it all, this 6-bedroom retreat Sounds Fantastic! There is plenty of room for your whole family, including your pets, at this soundfront getaway. With a ramp to the first level, an elevator to the rest of the house, and two bathrooms with easy access showers, this home is a perfect choice for anyone with limited mobility. All bedrooms have TVs and DVD players, and all levels have stunning sound views. On the first floor is the game room, complete with pool table, TV with DVD player, and wet bar with full-size refrigerator and microwave. 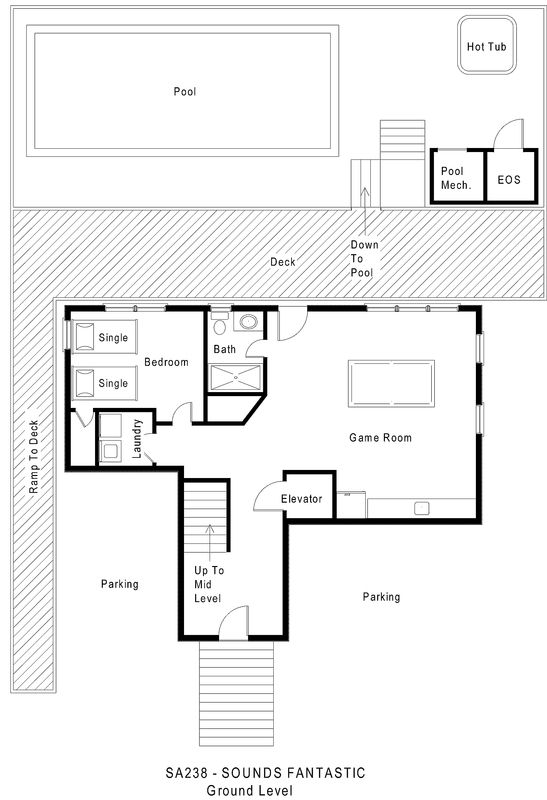 A bedroom with two single beds shares a semi-private bath with shower stall with the game room. Both the bedroom and the game room have doors opening onto the breezy shaded deck overlooking the pool area. 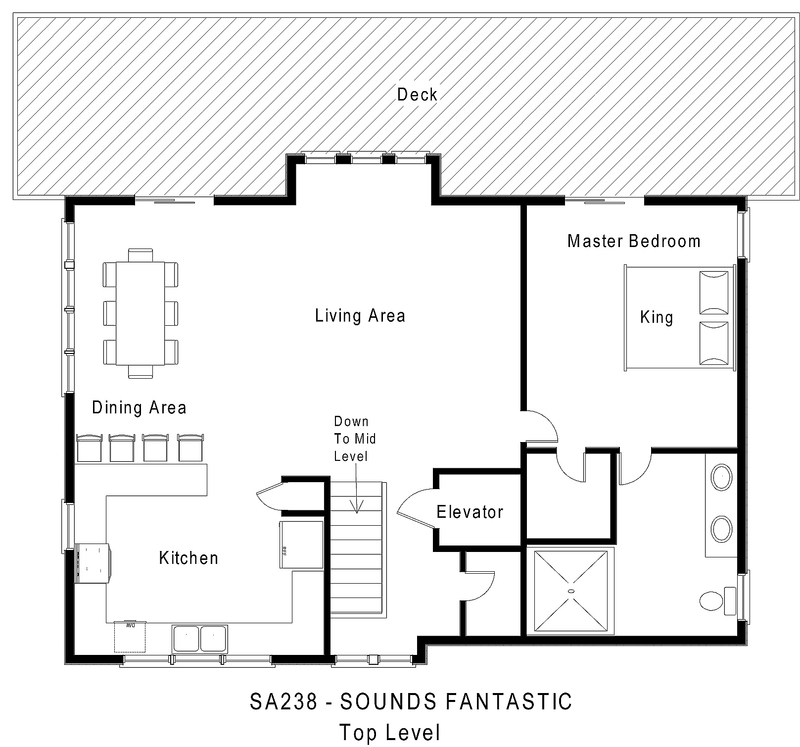 The second level has four bedrooms. Two king masters open onto another beautiful deck that wraps around the entire house and offers spectacular sound views. 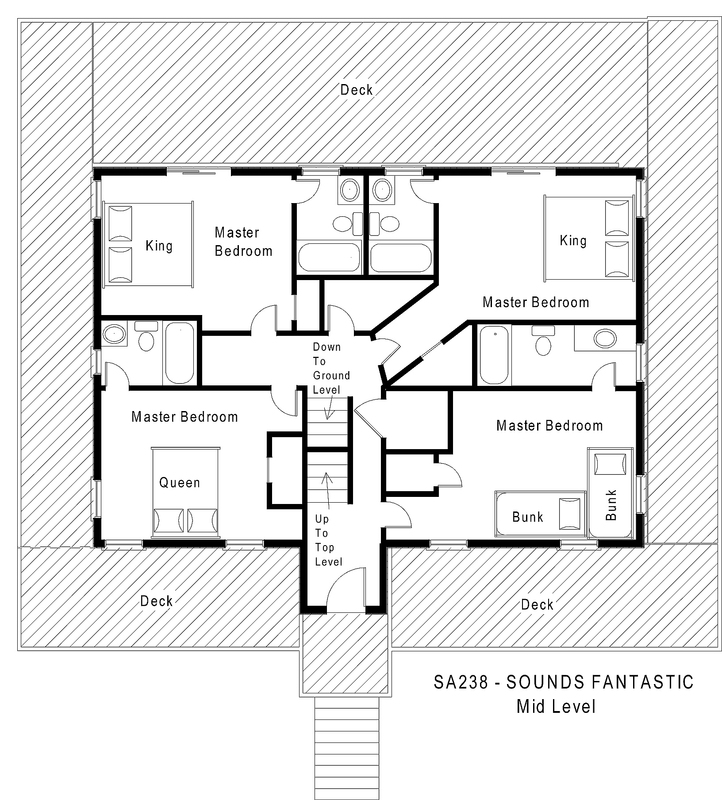 A queen master bedroom and a master bedroom with two bunk sets complete this level. Upstairs is the great room with hardwood floors and panoramic views of the sound. The spacious kitchen with wine cooler and breakfast bar will provide plenty of scrumptious family feasts. A dining room with plenty of seating opens onto a gorgeous soundside sun deck. Relax on the built-in bench seating in the reading nook with a good book. A half bathroom is on this level as well. Another king master bedroom with a custom-tiled shower opens onto the deck. Spend your days lounging in the sun on the wide pool deck. Cool off in the water or soak your cares away in the soothing hot tub. Nearby are local shops, an ice cream parlor, and the community sound access with dock and boat ramp. Sounds Fantastic is an excellent starting point for all your Hatteras Island vacation exploring. Scenic sunsets, cool island breezes, and an experience you will never forget await you. There is not a private access from this home, but there is a public access a few houses down at the top of the road. Is there a pet limit. My family has 3 dogs. All crate trained. This home will gladly accept your domestic, housebroken pets. The standard policy is no more than two pets per home. For special requests, please contact the Property Manager directly. Is there Wi-Fi at the home? Yes, all of our homes offer wireless internet as a standard amenity unless otherwise stated in the property description. For the 2018 season, this home does not offer pool heat. Is there access to the dock to the left? No, the dock to the left is a private dock attached to the home next door. Great house for families and pets. Kitchen had lots of space and was well equipped. Pool and hot tub were a plus and the views of the sound were awesome. We spent a lot of time outdoors enjoying the breeze and the views. Loved Salvo as it was quiet and less tourists than the northern part of the Outer Banks. Would definitely rent this house again. House is great size and has beautiful views! Great location and handicap friendly. The only cons are no working pool lights and no dock. There is a public dock about 5-6 houses down. The elevator was a god-send! And the sunset view was amazing!